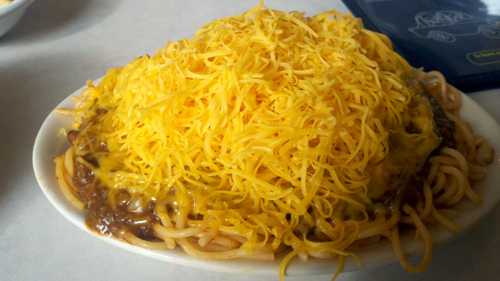 Left to my own devices and having a bit of time to kill between Cuyahoga Falls and Bedford I remembered having been taken to an outlet of Cincinnati chili by a Cincinnati native. 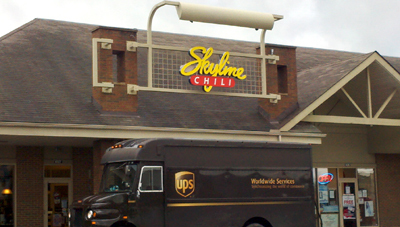 It was definitely different but I was having trouble remembering what I actually thought of it so I snuck in to dine with about half of the local UPS package truck crew (the one in the picture was actually delivering something). In Stow the place is located in a strip mall and looks like it’s in a strip mall. There is table side service and my favorite part of the trip was watching the poor waitress try to explain to the three UPS guys sitting next to me that they might not want “just a bowl of chili”. One of them just wasn’t getting it and they went round and round about how Cincinnati chili is not like regular chili, she brought him a sample that he refused to eat, it was fun to watch. 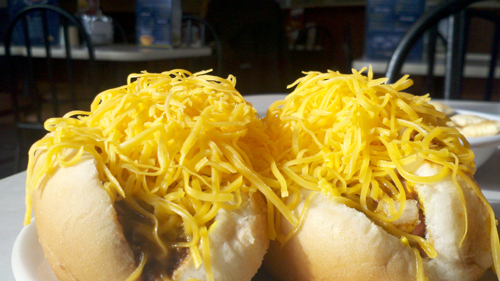 The thing that will strike you about Skyline is the cheese. Day-glo orange and piled four inches high on everything it obscures what is really going on. What really makes the difference is the chili. More of a paste than a soup/stew it reminds me most of Lafayette’s and All American Coney in Detroit. 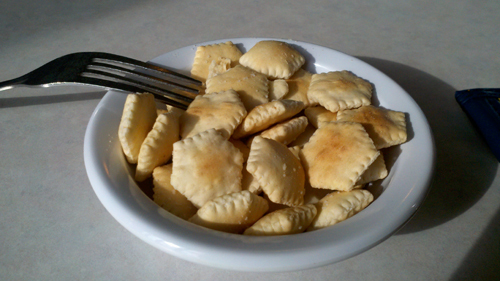 The difference from the Detroit version is the very Greek spices are much more pronounced in the Cincinnati concoction. It gives a very different twist spread on a dog and takes it’s own place in a “way”. 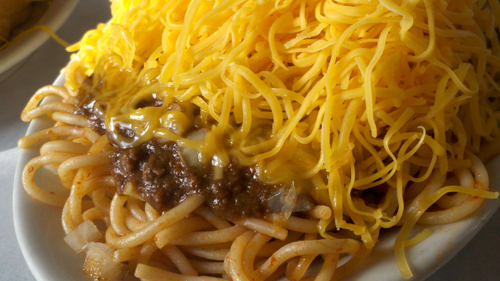 The traditional three way is spaghetti, chili and cheese. You can push it to four or five by adding beans or onions or both. With two dogs and a five way I got to work. I like the profile of the spices on the dogs and I am still trying to wrap my head around the spaghetti version, it’s fine just weird. 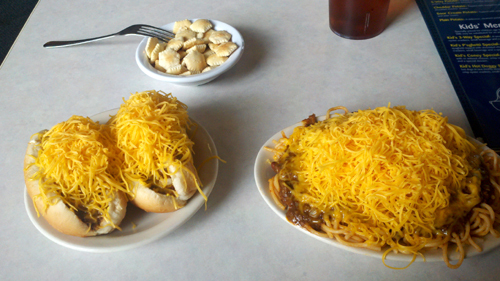 I love the cheese chili combo on a dog, Jib Jab being most near and dear to my heart, but it is possible to have too much cheese, and I think they get there at Skyline. When I scrapped some off and added a splash of their hot sauce I enjoyed both dishes a bunch more. It has no hope of eclipsing my fav but it’s nice to have something good and unique close-by.